Despite an absence from blogging in almost a year, this momentous occasion in my life has glued my fingers to the keyboard. I guess it had to be done. On Wednesday 16th September 2009, I arrived at Cardiff for my first day as a student. I can still remember the click of the lock as my parents pulled shut the door to my flat and I was left alone to drown in my longed for independence. Back then I was the shyest fresher on the block, awkward and anxious of socialising. I can still remember clearly my first night in Cardiff, playing Jenga in the Pen and Wig and enjoying one of my first legally purchased pints. Freshers Week was an immediate and unexpected trench of the University experience as I realised that my serious and introverted nature still left me in a niche minority. In the first few weeks I was bored and fearful as much as I was excited and on more than one occasion I found myself alone in my cupboard sized bedroom wondering whether my faith in University life had been disastrously misplaced. However I know now that the opposite was true. During all those teenage years whilst I longed for University, at no point did my expectations or dreams fly as high as the rollercoaster that I have been privileged to live these past four years. University life has been filled with hundreds of talented and amazing friends who have all contributed to creating the person I am today. Every achievement, success or lesson learnt has been the effort of teams, friends and acquaintances, some of whom I hope will remain best friends forever. These four years have been so much more than just networking, learning engineering or developing a CV. The opportunities to engage with societies, organise and attend events, write and edit newspapers, contribute to relationships and directly participate in politics have been extraordinary memories that will continue to boost my life beyond graduation. Yet, the experience has been more than just the accumulation of short term events and campaigns. Here in Cardiff, for the first time since childhood, I have truly felt a permanent sense of belonging and purpose. On so many days I have woken up with a sense of ambition and focus, ready to tackle the next door knock, the next lecture, the next article, the next meeting, the next event. The environment has not just been friendly but also forgiving and understanding. Students, more so than any other group in society, have an attitude that making mistakes is an acceptable symptom of the shared journey into adulthood. During these four years I have learnt to be much less ashamed in showing weakness, expressing a controversial opinion or flirting an emotion without being fearful of the consequences. I started out too nervous to contribute an opinion at a small Green Party meeting, to leading its local election campaign. I started out unable to make a five minute speech without my hand shuddering with anxiety, only to go on and speak in front of a crowd of 2,000 and debate across the country. I’ve knocked on countless doors, ran around campus as a Victorian villain and drank far too much in cheap night clubs. I’ve occupied lecture theatres, published my written opinions to thousands and had urgent phone calls with protest organisers. I’ve had dinner with elected politicians, shouted outside the vice-chancellor’s office and skipped many lectures. I’ve had many fond successes, made countless mistakes and regret none of it. In many ways I have become angrier, in other ways more tolerant, but in every respect I feel stronger. Every single day these steps, small or large, have been the result of pressure or support from others. Their enthusiasm, their understanding and more importantly their acceptance, have been the catalysts that enable my day to day actions. I am still, on the whole, a member of the awkward and introverted niche that I always have been. I’m still that overly serious kid, full of scepticism, doubtful of my place in society and lacking the visible signs of emotion or motivation that genuinely lurk beneath my skin. But I’m also proud to be an eccentric dreamer, an optimist and more ready to say ‘yes’ than ever before. I have more emotional capital than I thought I was capable of storing and a profoundly diverse range of friends, centred round a beautiful girl that I’ve been too lucky to find. Regardless of logic, I feel as though none of this could have happened anywhere else. The last few days in Cardiff have been exciting, but also frightening. In making the move to London it feels as though I am sacrificing this entire life that I have spent so long building up. I’ve spent four years gradually enhancing dozens of friendships, only to go to a place where I barely know a soul. Every day I have been filling up recycling bags of degree notes, folders, campaign materials and other memorabilia, selecting the essentials worthy of my suitcase. Over several weeks I have experienced my final committee meetings, lectures, visits to Engineering, exams, socials and chats, each time contemplating my imminent exodus. Moving to the big city of London and starting a professional job is a big scary step, but one I have been working and preparing towards. I’ve faced these challenges before, including the move to Cardiff four years ago, and I’m confident I can achieve things here. But the biggest emotion over the last few days has been sorrow not of the future, but of losing the past. I wish I could embrace the new world of work without having to give up the student life and the friends embedded within it. I wish that I could see my fellow engineering students in the offices of my conference company, come home to the same housemates and wander off to green party and debating society socials in the evening. Yet the passage of time, the only true enemy I have in this world, makes this dream impossible. University is always a life changing step in the lives of anybody who attends. For me, it is so much more. University has never just been the next step on the ladder of education, but a completely new world compared to the small Welsh town that housed me for 18 years. Despite my parents’ protests, Cardiff quickly became a place that I was proud to call home and a city worthy of its pedestal in my heart. Throughout my time here, there’s been a quote that I have referred to on a regular basis, which has guided and focussed my passions; “Life is not about finding yourself. Life is about creating yourself”. However if Cardiff has taught me anything, it’s that life isn’t just about creating yourself, although I still cling to the sense of power and purpose the phrase commands. Instead, my life here has been about opening myself up, allowing the world to peer into my weaknesses and strengths and mould me accordingly. Life is about creating yourself, but life is also a team effort. Life is surely also about finding the right people, the right friends, to help create and guide you along the way. And that, in short, is by far the greatest lesson University has taught me. Cardiff, it has been a pleasure, but now it’s time to tackle London. Good luck and Goodbye! Tomorrow (Friday) begins another Green Party conference. This will be my fourth and one of the most exciting yet. Having come third in the London elections and with a new leader elected only a few days ago, we’re getting more press coverage than we’re used to. It’s also the first conference at which neither the Welsh Assembly election nor my own run for a council seat is at the forefront of my mind. For me, this conference is more about networking, helping new members find their feet and thinking about the long term aims and chances of the party, as well as my role within it. It’s a good time to think about how I accidentally joined the party in the first place, about the campus meetings I attended only out of polite interest and how my involvement was initially stirred by environmental fears. After a good two years trying to widen the public’s understanding about our diverse array on social and economic policies, it’s often easy to forget that climate change is even taking place at all. And then I saw this graph, casually posted on Facebook by a (yes, Green Party member) friend. 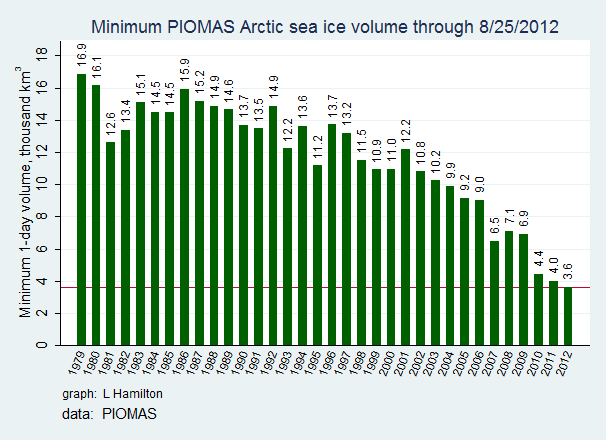 The green bars show the rate of decline in the volume of ice in the Arctic at their minimum (effectively the height of summer). Some experts believe that our first ice-free summer could take place within the next decade, an estimate brought forward from the 2050 estimate I was learning about when I started university. The sea rise implication is the obvious concern and it’s no surprise the 161 million people in Bangladesh are concerned about their future. However the less obvious issue is that replacing reflective ice with heat-absorbing darker seas is estimated to have the same warming effect as an extra 20 years worth of man-made emissions. There are obviously other ‘feedbacks’ too which most of my readers will be vaguely familiar with. Higher temperatures means more naturally occurring forest fires and the resulting deforestation means less carbon absorbed. 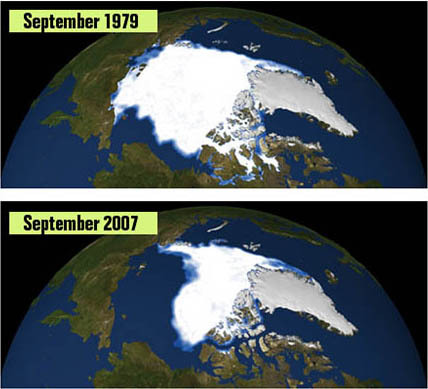 Melting of more ice in the Antarctic or Siberian permafrost means more greenhouse gases flooding into the atmosphere. Over the last few years we’ve seen heat waves in America, Russia hoarding grain after crops burned all summer, the wettest summer here in Britain on record, floods across the world, unusually strong hurricane seasons; the list goes on. Although no single event can be directly attributed to higher levels of CO2, people, even in this country, are being affected by climate change right now. There’s no denying that we live in a globalised world. Higher food prices and environmental crises hit us too. There’s strong speculation and analysis taking place about rising food prices being a major factor in the anger that sparked the Arab springs. Arguably the Arab springs are, at least in the medium to long term, a good thing. Although it does show how, indirectly, a small change in climate can have a medium effect on food production, which can have a major effect on society. Instability is generally not good for anybody and certainly not good for the economy. As time goes on, I am increasingly confident that we cannot rely upon current world governments or our current form of capitalism to solve climate change for us. Even if the Green Party here were to be boosted to power because of our social and economic policies, China, India, Brazil and the US are going to continue pumping more damaging gases into the air. Hence why I’m increasingly convinced that the only real solution is one of a global change of mind which unfortunately, were it to occur, would most likely be stimulated by a form of mass panic. Perhaps it will be when there’s no ice in the arctic, perhaps it will be food prices. A tipping point in social realisation that things need to change, and quickly. Only in that time of mass awakening can we realistically hope for the coming to power of Green Parties not just here but across the world – and it has to be across the world to make a difference. Even if the Green Party of England and Wales got elected, we would be a lonely voice. We’d have influence on the world stage, perhaps, but not much. The most I think we could realistically expect is for better and more secure domestic energy supplies, more sustainable and robust procedures for manufacturing and transport. In short, a lone Green government can help create a sustainable society within its own borders that will be better able to weather the storm of a global environmental catastrophe. That’s not a real solution. A real solution needs to involve the voting populations of our largest democracies demanding action. Of course I’d much rather see our planet think ahead and mitigate our emissions before that panic arises, but I fear that chance is rapidly falling away. So, it’s the night before my fourth Green Party conference and I’m asking where our party is going. Yes we’ll see more Green councillors and MEP’s and yes in 2020 we’ll hopefully have several more constituencies ready for targeting, a slowly developing group of opposition MP’s in Westminster. On a local level, Green councillors can help limit the effects of budget cuts and help develop stronger communities. Yes, we can influence policy, attach amendments and lobby at a European level. Yes we can use our media platform to educate and pressure other political parties. But I’m not an active member of the Green Party to help elect a handful of councillors here and help educate some students. I want to see strong, radical changes. Changes to the prioritisation of the environment, changes to education policy and healthcare, changes to housing conditions, banking regulations and transport. I want to see changes even to the core of our constitutional laws and the way in which democracy works in this country. Regardless of how hard the fight may seem today and despite how long the road may be, I joined the Green Party to win. I have always believed that a Green majority in parliament is doable. As time goes on I suspect that our biggest opportunity will come not because of the hard work of our activists or a sudden popular liking to our left wing agenda, but to a sudden cataclysmic realisation that we were right to prioritise the environment all along. Hopefully I am wrong and our hard efforts on the doorstep will be enough to make the change before the planet makes it for us. I fear the year that Bangladesh gets flooded, or the summer that the arctic totally melts or the shelves in supermarkets go empty because of exceptionally bad droughts and fires coupled with a speculative food market. I want us to combat these problems now, in fact I want them combated yesterday, but I just can’t see it any time soon. For now, the most I feel I can do is to continue to support the views and the party that I believe in and hope that one way or another we’ll avoid my fears of environmental catastrophe. I hope that we don’t have to rely upon fear to get elected. Our policies are good for working class people, for small businesses, for the broken economy, for young people looking for an education and a job and a house, we’re good for healthier, stronger communities. We have a message of solving climate change and our economic problems at the same time. We should be the party of hope, not the party of fear. Then I look again at the graphs, at the statistics and expert predictions, at the lack of action not just in government but in the minds of disillusioned voters. And truth be told, deep down, I have more fear than hope right now. For readers not experienced with my past, I was schooled through a typical comprehensive state school system. I have often spoke with emotion about the pains that I endured within it and despite some strong and well deserved improvements that my old high school has made since my departure (no causal link I hope) I still feel bitter about my experiences there. Through various lucky circumstances, a bit of hard work and good parenting I ‘survived’ that part of my life and am now three years into a degree which, although not spectacular, is a reasonably intellectual course at a good university. For pretty much the entirety of my school years, until I was eighteen, I lived in a working class town full of working class people. I met private schooled kids rarely and when I did it was for a fleeting moment at a chess competition or in passing. It wasn’t until University that I ever got to know somebody who had ever paid for compulsory education. There’s little doubt that private schools are better than state schools in an academic sense. Only 7-8% of students in the UK are privately educated, yet roughly 38% of students receiving AAA or better at A-level come from the privately educated group. There’s also a very large gap in GCSE results. Back when I was in high school, I used to think that it all came down to money and separation; firstly, that private school kids were ‘paying’ for their qualifications through better teachers, smaller classes, better equipment etc. Secondly, my view of private school was one in which all the pupils paid attention, time was spent teaching rather than simply controlling the chaos and keeping the kids off the streets. Meanwhile a lot of my lessons consisted of the latter as the lack of enthusiasm to learn and sit still disrupted my own education. I felt that having separate schools for different ‘types’ of people would be a solution – that I should be taught alongside only those roughly of the same intelligence and ability. I didn’t know, back then, that this theory has been tried and failed. A lot of my initial thoughts on money are probably accurate on a basic level but I now believe that money within the education system itself is not the largest problem, although certainly the state system is still heavily underfunded. However on the second issue of separation, my opinion has done a complete U-turn. Now I realise the solution is not segregation, but unification. The truth is, there are also some disadvantages to a private education, not in a strict academic sense, but in some social and cultural aspects. From my life embedded within a working class atmosphere it seems as though the majority of people in the UK have a biased view against the privately educated. It’s the commonly spouted opinion that they simply ‘purchase’ a better life, don’t work as hard as their own children in school and live ‘in a bubble’. They don’t understand the real world or have ever experienced the lives of ordinary people. Unknown children in TV documentaries or displaying their various talents on television (such as musicians or dancers or Olympians) are often assumed to be privately educated “because working class kids can’t afford to do that”. Politicians are referred to as ‘privately educated tossers’ who ‘don’t understand the real world’. The phrase ‘privately educated’ is used as nothing less than a direct insult. The fact that the vast majority of MP’s who have any chance of being the Prime Minister or a position in the cabinet are privately educated only worsens the ongoing lack of faith that everyday people have in politicians and the concepts of ‘ruling class’ and ‘privately educated snobs’ are increasingly used interchangeably. Meanwhile the working class have different social and cultural problems. It’s clear to me now that most of the difference in education is not what happens in school, but outside of it. Working class people are more likely to watch television rather than read in an evening, more likely to watch a pirated dvd rather than go to the theatre, more likely to be able to take their kids on holidays and afford extracurricular activities. The major gap is not money spent on schools, but the larger problem of inequality between the classes. The segregation of the classes also leads to varying attitudes. Amongst the wealthier families that I know there is a much stronger emphasis on not just doing well in school but applying for the better universities, preparing for interviews etc. Meanwhile much of the working class not only accept their place in society but are also proud of it; the “I’m working class, I work for a living,” attitude that they feel separates them from the ‘lesser working’ upper class. Although the ‘better’ working class parents encourage their children to do well in education (and quite rightly) there is also a very strong habit to encourage ‘overall happiness’ (again, quite rightly, education isn’t everything). For some reason there seems to be an underlying theme amongst working class culture that overall happiness is most easily gained by socialising and living within the working class, or at least lower-middle class bubble. 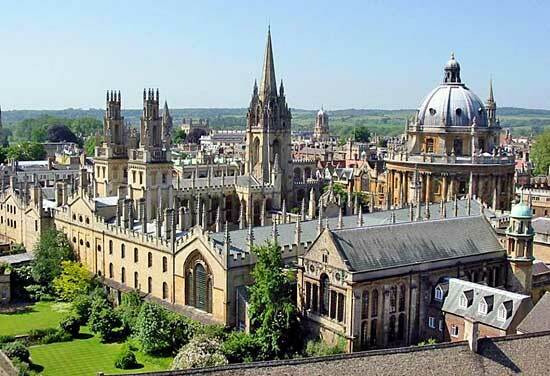 In fact many people are encouraged by working class culture (including myself) to not apply to the best universities (Oxford and Cambridge) because they are heavily populated by privately educated (and hence stuck –up snobbish) students and that ‘you would struggle to make friends in a place like that’. Even the concept of having richer or privately educated friends is cautioned against under the threat that ‘you wouldn’t be able to engage in all the trips and activities that they do and you’ll feel left out’. I emphasise, not all of these views are necessarily those spread by my own family or taken for granted by those who hear them, but these views definitely gather momentum in working class communities, often with very little evidence. Remember, most of these people have never properly met another human being who has engaged in private education. Hence the current inequality in education between the classes is, although not ‘encouraged’ is continued through the inertia of the status quo. So, what to do? At the moment, if I were the (somewhat inexperienced and biased) education secretary, I’d be seriously tossing up the idea of not just ‘encouraging’ a more integrated approach to education, but a forceful closure and banning of private and independent schools, forcing ‘rich kids’ and ‘poor kids’ to blend together in the classroom. There would still be class divide of course. Richer children could have extra tuition at home, more holidays, have better equipment and access to extracurricular activities. They’d also still be more likely to socialise with students who live near them or with similar class backgrounds. However shoving everybody in the same boat would encourage society as a whole to raise the standards of the boat. I think one of the biggest problems is that the wealthier and most educated people send their students to private school and care little about the local state school as a result. In fact it ends up being against their short term interests for the state to spend extra money on the education system at all. If the children of doctors and lawyers and company CEO’s suddenly have to send their children to the local comprehensive, I reckon we can expect better attendance at PTA meetings, parents days, school consultations and the like. We can expect more pressure on the government and teachers to raise standards. Furthermore, and most importantly, it gives everybody a real taste of what’s on offer beyond their own class. There is much less of a case against the rich kids about them ‘not understanding the real world’ and even more importantly the poorer kids are raised up as a result. They see that those achieving top grades are not simply paying for an education, but are working hard for it. It helps break down the mental wall within the working class mindset that money buys success but that hard work buys success instead. Simply getting people to believe that the latter correlation is stronger than the former could do a lot of good. 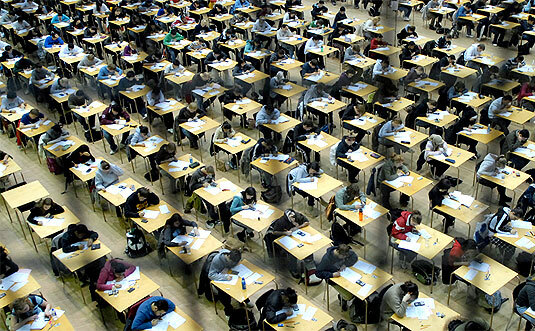 Perhaps the greatest problem amongst working class students is not a lack of money or a lack of educated parents or even a lack of encouragement but a lack of belief of fair prospects. People are increasingly seeing this country as one divided by class, one in which entrance to the ‘bubble of success’ has to be bought and is inherently difficult to earn, regardless of effort. If we want to break down these bubbles and create a society based on merit, effort and ability then surely the education system has to be high on the list for reform. If we want a society where we are ‘all in it together’, then we need classrooms with a similar ethos. With local elections and exams now cleared and the four-month summer holiday beginning to be embraced into my life, I thought it time to spread my dusty wings of blogging and reinforce my ‘radical’ views upon the world once more. If this was the house of a city banker, we’d riot on the streets. When arguing against the continuation of the Monarchy, let’s put aside the drivel about tourism and the financial costs. Yes, the Americans come and take glossy photographs of Buckingham Palace to stick on their fridges and yes, this does generate some level of income for us. However our history is going to remain and any real loss in tourism from replacing the Queen with an elected head of state is not going to have even a negligible effect compared to even a slight shift in our economic policy or quantitative easing from the Bank of England. The budget required to serve and protect the Monarchy, or have a referendum, or hold elections for a President or any other potential consequences of my proposed republican actions are pennies compared to our national expenditure, or the tax evasion we suffer each year. From my countless pub-arguments and facebook-debates surrounding the Monarchy, there have only ever been two clashing arguments that have seemed worth exploring. Firstly, the principles involved in handing an arbitrary family wealth and influence without the need to earn it and, in contrast, the argument that the Monarch brings stability and experience into an otherwise sporadic and constantly polarised world of politics, ruled by MP’s who often have little or no experience of ruling in practice. Continuity is good, in the right place. Politicians need some long-term checks and balance. It’s why we have the civil service; it’s why we have a House of Lords (even if it’s elected). We don’t need the Monarchy to do that. 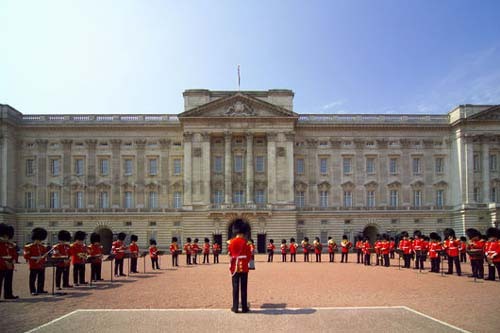 If we want experience and historical knowledge, then the people can elect an old man or woman as their President, who can wave the Union Jack just as vigorously from the windows of Buckingham Palace. So if we want knowledge and experience we can look elsewhere or incorporate it into a new section of our government- we don’t have to rely upon the Monarchy. There’s only one real reason why I’m a republican– it’s because I believe that success in life should be determined by ability and effort by as much as possible. It’s the same reason why I’m pro-inheritance tax or against the existence of private schools. The ideal future, be it realistic or not, is a world in which everybody who is born into this country has the same equal access to resources and opportunities and the same ability to achieve their ambitions. Clearly there are obstacles which cannot be overcome and which will limit this ‘utopia’; some families will always be richer than others, some schools will have better teachers than others and some are simply born with more intelligence and confidence. However I do believe that politics should be a force in the right direction and although the head of state may only be one job amongst the millions available, it is doubtless one that is well advertised. Today, the country celebrates 60 years of our Queen sitting on the throne. Children, teenagers and even adults are being told by their schools, by the media, by politicians, even by the ‘neutral’ BBC News that this is an important event. Tesco’s sells Jubilee paper plates, the news shows non-stop coverage of smiling faces whilst a republican protest goes barely mentioned. We’re told and encouraged to celebrate the Queen, because she’s the Queen. Of course there are lazy attempts for justification; “celebrating her 60 years of dedication.” Well who wouldn’t be? Born into wealth and fame, job security like no other and regular trips to the exotic corners of the world- it’s a job that I’d happily be dedicated to. 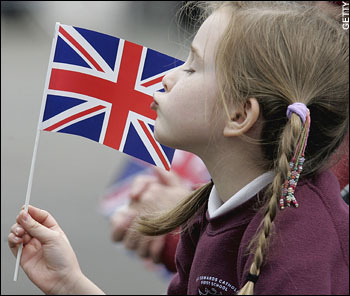 So we teach our children to celebrate the Queen and the history she represents and to keep history alive we continue the injustices of history through traditions and images of flags and faces. We’re told by the media, by politicians and by the men and women indoctrinated within it that celebrating the Monarchy is British. And that’s that. Beyond that simple word there is no comeback. That is what the Monarchy has produced; a country in which fighting for equality, showing a preference for democracy, is Unbritish. There isn’t even respectful room for debate. The Queen is a small problem, in herself. But she reminds me of the continued lack of progress towards the equal opportunities that my politics works towards. She reminds me of the inequality between rich and poor, she reminds me of how some are born into opportunity whilst others are not and she reminds me of how tradition, the media and successive right-wing governments stifle the debate for change with propaganda; how we’re British, how we’re facing tough times, and how we’re all in this together. I have nothing personal against the Queen or any other member of the Royal family. I’ve never met them and I try to withhold judgement until I do. But they represent everything I am against and that, quite frankly, makes me sick. So, this is it. The below chart represents a year of my life; many tens of thousands of leaflets, thousands of doors knocked, hundreds of conversations had. We had an amazing diversity of support; students fed up with dodgy landlords, families wanting an independent voice instead of party whips, old men who would usually vote far right who wanted a stronger community. 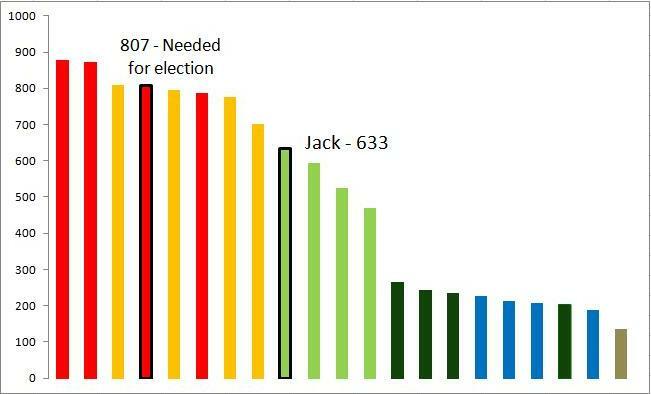 After everything, I received 633 votes, a reasonable but modest gap short of the 807 needed to get elected. Personally I found myself less upset by defeat than I would have expected. From the count it was clear that we had torn the other parties apart in student areas. Streets behind the Students Union, Colum Road and streets off Wyverne Road had clearly turned Green due to our campaign. We also saw strong returns in more suburban areas of Cathays – places such as Gelligaer Street and Maindy Road put us not very far behind the major parties. Unfortunately the Labour and Lib Dem support from the city centre and postal voters pushed our support back and we ended up with the results above. Even though we gained the support of the students which represent 70% of the ward, the much higher turnout amongst higher residents simply overwhelmed us. Green Party for Cathays 2016/7? There was good evidence though that Cathays is ready to turn Green. A considerable number of people split their votes; giving a vote or two to some of our candidates, but also voting for other parties. From our experience on the campaign trail this is most often likely to be because the voter liked our policies but didn’t believe we could win. We deployed a ranked candidate scheme during the campaign, asking people to vote firstly for myself and then for Sam Coates if they decided to split their votes. Yet, it could be seen from the count that many people used a vote for Sian or Seb, our other candidates, and not for myself or Sam- possibly because they spoke to those candidates on the doorstep. If everybody who had voted for at least one of our candidates voted for all four, then each of our candidates would probably have received close to 650 or maybe 700 votes. Once you then take off the Labour and Lib Dem votes that those voters wouldn’t otherwise have gained under this scenario, it would have been excruciatingly close. Meanwhile the Green Party did well across the country, gaining 11 council seats across the UK, including a seat in Oxford gained by a friend of mine. Several of these seats were gained by the Scottish Green Party rather than my own England and Wales Green Party but either way, this is a good show of strength at a time of a Labour uprising. In fact across the UK only two parties did better than the Greens; Labour and SNP. All other parties in existence gained less, stayed the same or lost seats. Meanwhile we became the third largest party in London; not just coming a clear third in the Mayoral election but also being one of only 4 parties with representation in the London Assembly; retaining our two seats and staying equal third largest group. Of course I’m bitterly disappointed that I wasn’t elected this time around, but I am in no doubt that this will be my final electoral campaign. There is no election in 2013 to distract me from finishing my degree, but beyond that point I am sure my involvement with the Green Party will continue to grow- amongst the Young Greens, internally within the wider Party and also as a candidate in other elections here or elsewhere. This election has given me confirmation that politics is where I want to belong. In addition, a diverse spread of 633 residents believed that I was competent enough to represent them and help run their council; to deal with their children’s education, to spend their taxes, to protect them against the austerity being sent from Westminster. That’s a good boost of confidence for a 20 year old undergraduate who has been actively involved in daily politics for less than 18 months. Labour have made strong gains in this election up and down the country, but it is becoming increasingly clear to many people and especially amongst my own generation that they are not the centre-left party they used to be. From wars in Iraq, to bringing in and raising tuition fees, to failing to support local people against job cuts for the sake of electoral perspective, people are seeing them for what they truly are. The Green Party is growing quickly into the position of the third largest party of the UK and once we replace the Lib Dems at the podium on televised debates, the country will see that we are much more than environmentalists. We are the fair, sensible and credible party that the working class need and deserve. When that time comes, I intend to still be apart of it, as central and as involved as I possibly can be. That time will come, and I cannot wait to live it, even if it isn’t today or tomorrow. The energy and determination with which I ran this campaign has grown larger and deeper and next time I will be infinitely more knowledgeable and educated, much more experienced of campaigning and life in general and much more in desire of giving anyone in my way a good, solid beating at the ballot box. This is only the end of the start. Cathays Green Party The campaign that dominates my life. Facebook We’ve all got one.